We live in a world where we want everything quick. Better yet, how about immediate, fast, and tomorrow is too late. 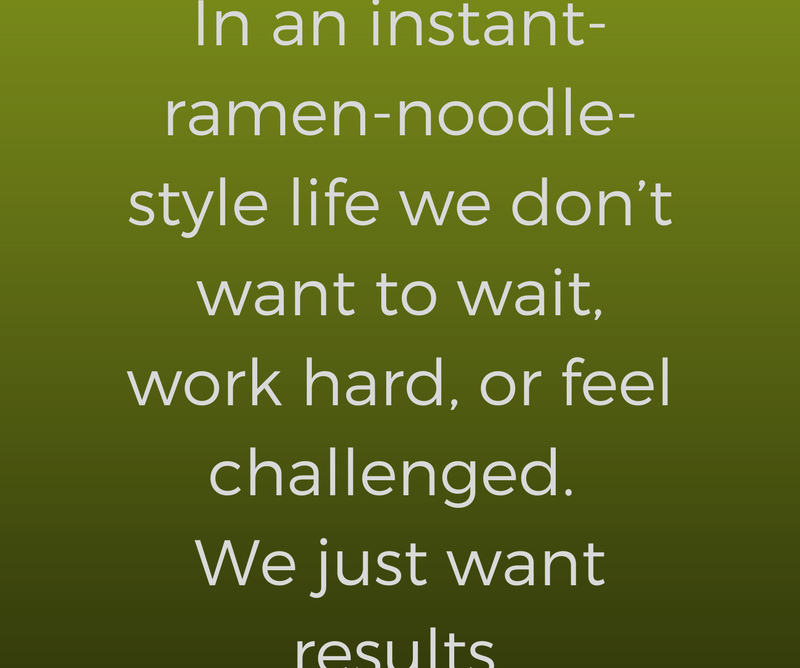 In an instant-ramen-noodle-style life, we don’t want to wait, work hard, or feel challenged. 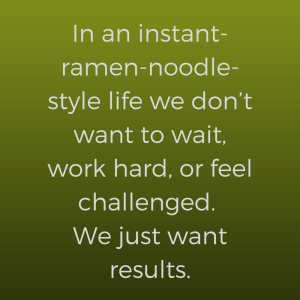 We just want results. The truth is that most book projects are more like making a batch of chicken stock than they are like instant ramen noodles. Stock can’t be rushed if we want excellent results. To make the best stock we have to be willing to let the ingredients simmer and allow the heat to extract the flavor and gelatin from the bones. The results are worth the time and effort of preparing stock the correct way. Perseverance is defined as steadfastness in doing something despite delay or difficulty in achieving success. I’m two weeks away from turning in two book manuscripts and today I launched my September Hungry For A Cookbook Mastermind Groups. For the past two months, I worked hard to promote and invite aspiring cookbook authors to participate in the Mastermind group. I met my goal and had members sign up. At the same time, to complete my cookbook manuscript, I have scheduled time on my calendar for results-focused activities. In a recent blog post, I wrote about commitment. Making the commitment to anything new provides fuel to get you started. When you sign a publishing contract, you commit to completing a manuscript. When you launch an online program, you see it through in spite of any difficulties you may encounter. Ask anyone who is in the middle of a book-writing project, or launching a new program, and they will tell you that determination and persistence, aka perseverance, drives them toward the finish line. While researching material for this blog post I created a set of questions based on qualities that are present in individuals who persevere. With those in mind, and using my experiences with book and work projects (and marriage and raising children! ), I added more qualities that I’ve found to be helpful for perseverance. 1. Do you feel resilient? When you come upon a challenge or setback in a project, you may feel defeated. The choice is now yours: you can quit or bounce back and keep trying. 2. Do you ask for help if you’re stuck? Feeling supported and connected in the achievement of your goal help you persevere m. Seek out role models or mentors that you can turn to when you have questions. 3. Do you practice self-compassion? Take it easy on yourself if you make a mistake. Avoid negative thoughts about setbacks and do give yourself for a misstep. Practice positive self-talk and get yourself back on the track to completion. 4. Do you accept that uncertainty of the outcome is a reality? Surrender to the fact that you can’t control a lot of what happens in your life. Focus on what you can control – your hard work and effort. 5. Do you maintain a sense of humor? There’s a time to be serious and strict, but be sure you balance that with the ability to laugh at yourself and your mistakes and move on. 6. Are you a mindful person? Focus on today, and the hour you have before you. Work on small, accomplishment-oriented tasks to keep your project moving forward. 7. Do you see the big picture? While focusing on tasks for today, it is good to use your vision to keep you motivated. Imagine holding your printed cookbook. Imagine clients engaged in your programs. A view of the big picture can provide motivation to keep going. 8. Do you love a challenge and work harder when something gets hard? Adopt a growth mindset and accept the challenge as an opportunity to improve your skills and yourself. Be willing to take the stairs, not the elevator. 9. Do you strive to be a better version of yourself, rather than trying to always compete with someone else? Each time I write a cookbook, I try to improve on my last book and on my systems that I use to write the book. I learned from what I’ve done before and applied that to my next project. Competition needs to make us stronger in our actions and not lead to envy, bad feelings, or quitting because we don’t think we’re as good as the next person. 10. Do you value practice? Making an effort to try, and to keep learning even when you don’t see immediate results. Practice, practice, practice. Using the ten questions above, score your perseverance quotient. Take a look at the areas where you excel and be proud. Use them to build something new in your work or personal life. And for areas where you need to improve, use current projects or life situations to practice these qualities. Life always hands us what we need to learn, grown, and become people who persevere.